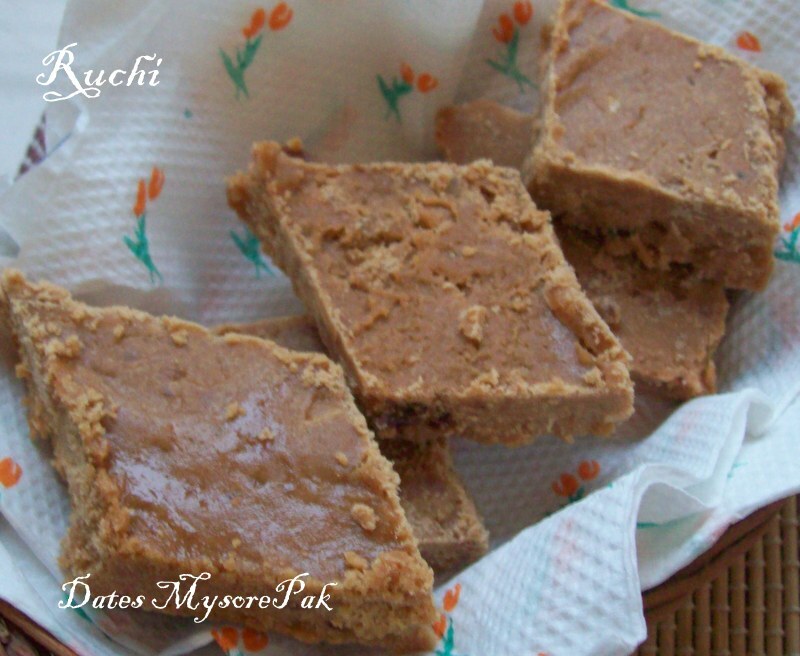 Mysore Pak is a popular South Indian sweet dish.I tried Coconut Mysore Pak and now I tried it with Dates! 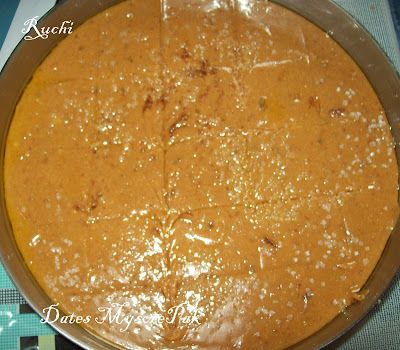 Date Mysorepak is something unique and I tasted this sweet in my friends Housewarming ceremony few months back. I learned this recipe from the cook who prepared this sweet. It is absolutely delicious and I loved it! So I wanted to try it as his stepwise was so clear and I felt confident about making it. The first time I tried, everything came out perfect but the texture is not perfect. Because just I added dates I didn’t grind it. So when I tried it again I roasted besan till aroma comes and I grind dates with milk and added in sugar syrup and makes to boil. ... Date Mysore Pak was incidentally the best sweet to come out of good efforts .Now It was apt both texture and taste wise- so damn worth exceedingly soft with a melt-in-the-mouth and extremely delicious. 1. Heat 2tsps of ghee in a heavy bottom wok and roast the besan flour in it, till you get a nice aroma of besan. 3.Cut the dates into small pieces after removing the seeds and soak it in milk for halfan hour. Then Grind to fine paste. 4. Take the sugar and water in the same wok and heat it till one string consistency. 7. Look out till the mixture leaves the sides of the wok Add more hot ghee and keep stirring until the ghee separates from the mixture. 9. Using a knife cut into pieces and serve.. You will get very soft Dates Mysore-Pak and certainly delicious. From one cup of besan flour you will get at least 20 pieces . During festival time, this sweet will be very easy for you to make and am sure friends will ask for the recipe:). Nice twist to the usual mysorepak, looks very yummy! This is fantastic, Jayashree! A really novel makeover to the popular Mysore pa! Omg, wat a fantastic twist Akka, well done..any leftovers there?.